A new Fiat store in downtown Los Angeles. 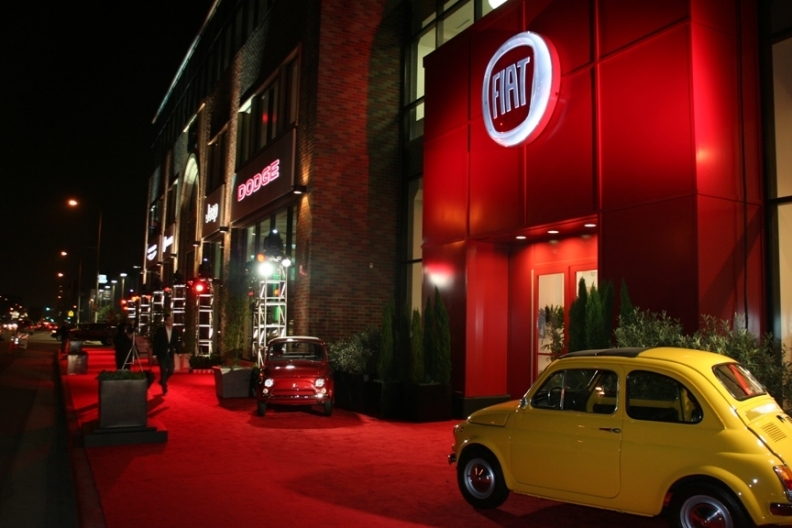 DETROIT (Bloomberg) -- Chrysler Group LLC is behind schedule in opening Fiat showrooms in the U.S. and expects most of the 130 planned stores to be operating by September. About a dozen Fiat franchises have started up and a total of 20 may be open by the end of February, said Laura Soave, head of the Fiat brand for Chrysler. About 30 to 40 will be open by the middle of March, she said. Chrysler said in September that it wanted Fiat showrooms running by the end of February, adding that it would allow some dealers to open later. "It's a tiny bit behind," Soave said today. Chrysler is using the Fiat 500 small car to reintroduce the Italian brand in the U.S. after it pulled out almost 30 years ago. The 500 features a clam-shaped hood to evoke the vehicle's traditional design. Special first-edition versions of the 500 that were pre- ordered by enthusiasts are being shipped to dealers now and should arrive by the second week of March, Soave said. Dealers should start receiving inventory by late March, she said. Rising gasoline prices may help attract more customers to the 500, Soave said. The car can travel as far as 38 miles on a gallon of gasoline in highway driving, according to Chrysler. "It is definitely going to quickly get our awareness out there," she said. "They're going to look at us a lot quicker than they would have without that." Some dealers, working to prepare their facilities, have been delayed because it has taken longer than expected to get local government permits, Soave said. "We've approved all of the dealers' plans," she said. "So now it's just a matter of going through the process." Chrysler is assembling the 500 at its factory in Toluca, Mexico. Fiat, which owns 25 percent of Chrysler, already has sold 500,000 of the cars in other parts of the world since 2007. The 500 starts at $15,500 in the U.S., excluding the destination charge.